In 2014, Richard Thompson released "Acoustic classics", an album that took a number of his songs and rearranged them in acoustic form. It was a great album, and he is now following that with "Acoustic classics II". He is not stopping there either as he has plans to release "Acoustic rarities" later this year. Its always slightly strange at first hearing a song that you like being re-done differently, either by a different band, or just being done acoustically. Sometimes the new version works really well, but sometimes you cant get rid of that nagging feeling that its just not as good as the original version. Often too a song that sounds fantastic on electric guitar can lose much of its appeal when played on acoustic guitar as theyre very different instruments, and thats even more apparent with guitar-driven songs so it needs the right song for it to work in both electric and acoustic versions. 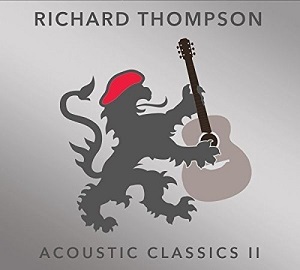 Happily Richard Thompson has an extensive catalogue of songs to choose from and that includes a lot of really strong songs that work well in both acoustic and electric guises. When you strip a song down to the basics and perform it on a single acoustic guitar to accompany the vocals then only the best can keep the audiences interest for 54 minutes. The songs have to be extremely good, the playing has to be spot on and the vocals need to be very strong too. Richard Thompson takes on this task and makes it seem easy - the album is absolutely fantastic and there is never any feeling that the songs sound too similar to each other. It holds the listeners attention, not just for the 54 minute duration of the album, but for far longer - Ive listened to the album several times on repeat and it never gets repetitive or boring. Superb work from Richard Thompson.